Fictional books have a special sort of attraction. Who wouldn’t want to peruse Borgesian infinite libraries, or wander through the halls of unwritten books stored in the library of the Sandman (Alice’s Journey Behind the Moon by Lewis Carroll, anyone?). Perhaps the most mysterious of such book is the Necronomicon.. It’s a truism to note that much of H. P. Lovecraft’s lasting influence is the deep mythology woven into his work. The Cthulhu mythos has outlived its creator (or medium? host-body?! ), becoming a source of inspiration for numerous other writers as well as practising magicians. Chaos magicians such as Phil Hine have worked the Great Old Ones of the Cthulhu mythos into their magickal rituals, while Kenneth Grant, former secretary of Alisteir Crowley, argued for a fundamental magical reality to Lovecraft’s fictions that even the author himself was unaware of. At the heart of the Cthulu mythos lies the Necronomicon, a magical grimoire written by the “Mad Arab” Abdul Alhazred, a worshipper of Cthulhu and Yog-Shoggoth. Containing an account of the Old Ones, their history, and various means for summoning them, the Necronomicon had a complex history, as outlined by Lovecraft himself in the History of the Necronomicon. Despite Lovecraft’s private protestations that the book was a product of his imagination alone, the Necronomicon has been remarkably persistent in manifesting itself in the “real world” too. If you were to visit the University Library of Tromsø, Norway, for instance, you would find listed a 1994 version of the Necronomicon, attributed to one Petrus de Dacia, although the document is ominously listed as “unavailable”. Or you might be able to track down one of the 348 editions published by Owlswick Press in 1973, written in the indecipherable, apparently fictional language known as “Duriac”. More easily available is what has become known as the “Simon Necronomicon”, a translation of the “real” Necronomicon by the pseudonymous Simon. The blurb rightly warns the reader that this is indeed, “potentially, the most dangerous Black Book known to the Western World“. Also easily available is 1979 Necronomicon edited by George Hay, with an introduction by noted occult scholar Colin Wilson. Welcome to the first of new series of posts where I highlight how some specific human enhancement technologies have been developed, their real world applications, their philosophical implications and how these have played out in the pages of the superhero comic book. So if what you really want to see are pictures comic book characters who have had their heads transplanted then scroll on down, because there is going to be plenty of it. For those of you hanging around still, here’s a bit of context. If you follow this blog then you’ll already know that my name is Dr Scott Jeffery and that my PhD thesis was on the posthuman body in superhero comics (for a condensed version of the main ideas click here). Anyway, a book that draws on the thesis but is less painfully academic (I want to say it’s ‘accessible’, but that I suppose, is a question of taste) is on its way in early 2016 (more details as and when). In the meantime, as I was editing and rewriting it occurred to me that the book doesn’t really focus on specific technologies as such. So for this new series I want to go into more detail about specific technologies and how they have been presented in posthuman theory, practice and superhero comics. Saying that, this is still the blog, so the depth and breadth of each of these articles will probably vary somewhat. We start with one that is not mentioned at all in the book but has recently been making its rounds on the hive-mind of social media: human head transplants. Hello everyone. 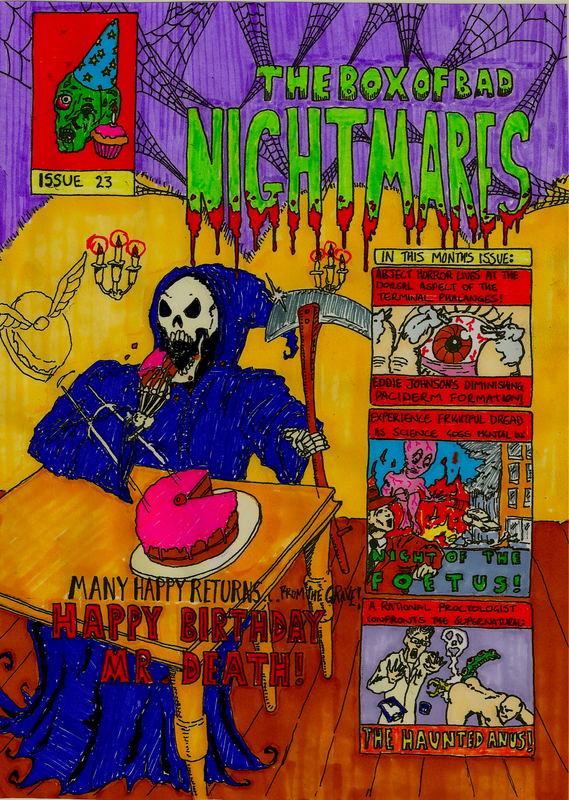 Something a little unusual today: a rare copy of The Box of Bad Nightmares Issue 23! 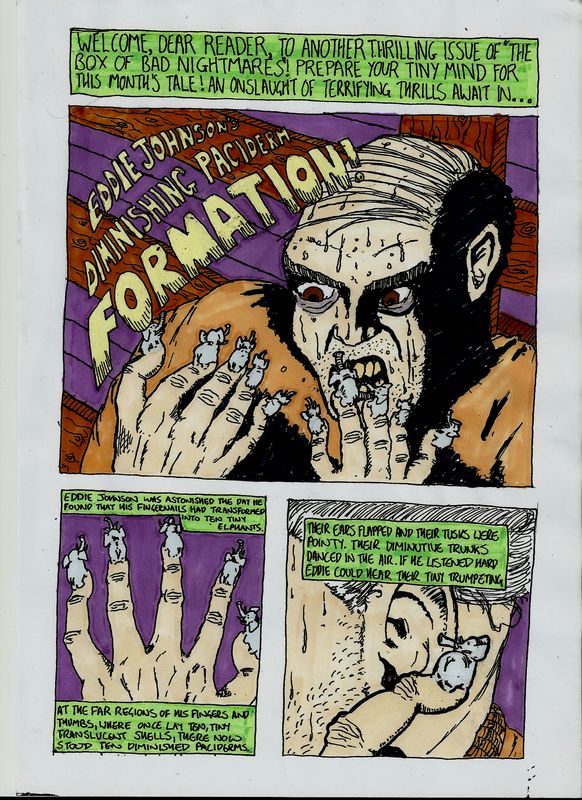 Alas, it has hardly been kept in mint condition and all that remains is one tale from the anthology, Eddie Johnson’s Diminishing Paciderm Formation (complete with the original misspelling of Pachyderm that made the issue such a coveted collector’s item). Welcome to the sixth edition of Comics are Magic (click link for the archives). This is just a short one because its been a while. It concerns the magical influence of classic Silver Age story The Flash Stakes His Life On You! from The Flash#54 by way of two modern magicians and comics creators. The first, Alejandro Jodorowsky is probably best known for his films, the alchemical allegories El Topo, The Holy Mountain and Santa Sangre. For those unfamiliar with his work here’s the trailer for his masterpiece The Holy Mountain. That’s subjective of course, and they are all stunning, mind-warping films, but The Holy Mountain is I think clearest in its alchemical intent. A young Chantal, at four years old, found herself placed in a school directed by the sister of the mother of her mother…The great-aunt sadistically tyrannized the child. In working with me, Chantal discovered all the hate she held towards to this woman. She could not forgive her, and she had no way to avenge her because the torturer was no longer in this world. So I advised her to go to the grave of this woman and, once there, give free rein to this hate: that she kick, scream, piss, and defecate on the tomb, but provided that she dedicate herself to paying close attention to her subsequent reactions to her demonstrations of vengeance. She followed my advice, and after letting off some steam atop the sepulcher, she felt a deep desire to clean it up and cover it with flowers. And, little by little, she couldn’t help but surrender to the evidence that she, in fact, felt love for her great-aunt. Jodorowsky has worked regularly in the comics medium. 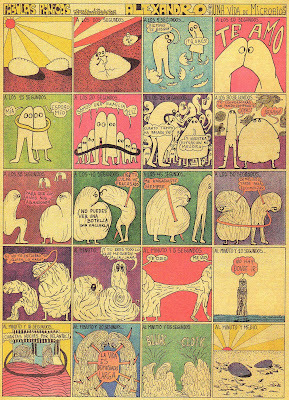 His earliest comics work included the strip Fabulas Panicas, which debuted in 1967 (and ran to 1973) in the Mexican newspaper El Heraldo de México. 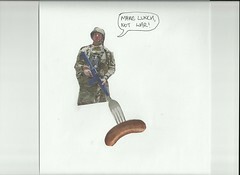 Below is one of these strips. 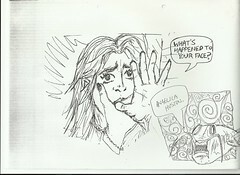 There are many, many more over at fabulaspanicas.blogspot.co.uk, dedicated entirely to reproducing the strip and well worth your time. Even if like me you don’t speak Spanish. Part One of this ‘thesis review’ introduced the philosophical and theoretical concepts that guided the research undertaken in my thesis. Part Two elaborated upon these ideas- paying particular attention to the concept of the rhizome-and suggested that the field of Comics Studies could be considered as rhizomatic. It then went on to demonstrate how approaches to studying superheroes that utilised structuralist theories and/or analysed the superhero comic in terms of representation and ideology could be understood as broadly humanist and based on an arboreal model of knowledge whereby the ‘meaning’ of the superhero could be reduced to a single explanatory trunk. It then went on to argue for a Post/Humanist approach to superhero comics that, rather than an arboreal model, adopted a rhizomatic approach. 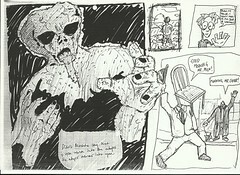 To aid this understanding a cultural history of the posthuman body in superhero comic was adopted. It was then demonstrated how this moves the analysis of the superhero away from ideology by understanding the development of the superhero through the Golden, Silver, Dark and Modern Ages of comic books in terms of historically situated assemblages. If the rhizomatic cultural history was suggested as a theoretical corrective to the limitations of ideological analyses then it was also important to address the implied reader at the mercy of ideology in these approaches. As such my thesis involved another strand in which I interviewed comic book readers about their views on the superhero and posthumanism more generally. This was seen as a methodological corrective to the problems outlined in Part Two. Welcome to part two of my thesis autopsy, where I pick apart the first draft of my PhD and try to remember just exactly what it was I was trying to study when I began. As always, this is the blog and not the thesis itself so while there’s a lot of references in what follows its also likely to slip into a more conversational style. Let’s just jump straight in. My thesis began with two broad questions: what could the development of the superhero tell us about posthumanism, and how did readers of superhero comics relate to the posthuman? In Part One of this thesis review I pointed out that answering those questions first required clarifying the epistemological and ontological assumptions underlying them. So it was that Part One introduced several concepts borrowed from Delueze and Guattari that served as the theoretical guide for undertaking this research project. In this part I want to re-introduce Deleuze and Guattari’s concept of the rhizome (touched on briefly in part one) and how it differs from traditional models of thought and culture. These ideas will then be illustrated through a discussion of the filed of Comics Studies as rhizome, and also how many scholars approaching the superhero have relied on structuralist analyse (often accompanied by an ideological critique). Such approaches, whether positive or negative in their final reading of the ‘meaning’ of the superhero, are presented as arboreal or tree-like. I argue that such approaches can be characterised as Humanist. The rhizome is then offered as an alternative, Post/Humanist model for thinking about superheroes. The article then goes on discuss how Foucault’s notion of discourse operates within a rhizome. Several theoretical (and occasionally methodological) objections are raised to move comics analysis away from questions of representation and identity politics, and an argument put forth for the production of a rhizomatic cultural history of the posthuman superhero body. Hello you! There’s been no blog posts for a while. Comedy and academia have been eating up my time. In a few days time (Friday 15th to be exact) the world premier of Woodward and Jeffery: Laughter on the Outskirts will be on at the Leicester Comedy Festival. This looming comedy deadline has had the added benefit of forcing me to go full pelt at completing a draft of my thesis beforehand. (UPDATE: It’s been and gone and I wrote about it here). It’s been a long three years, and its not over yet. But with a full initial draft of my snappily titled thesis Producing and Consuming the Posthuman Body in Superhero Comics finally in the bag, now seems a good time to present some of the ideas from it on the blog. A ‘thesis review’ where the monster’s still dying corpse can be dissected and unimaginable, as-yet-unnamed organs extracted from its still-warm carcass and held up to the light: “Now look what we have here”, I will say, rubbing the ungodly creature’s black blood on my lab coat. As ever, the reader is forewarned that this is the blog and not the thesis itself, so expect a potentially unpalatable mix of personal literary style and academic writing. Although to be fair if you are still with me after the whole monster autopsy thing then we’ll probably be okay. So lets begin. Secondly, I wanted to know what sense comic book readers made of the posthuman body. For example, did a familiarity with the superhero genre make one more or less amenable to the idea of human enhancement as espoused by Transhumanism? The question of reader-text relationships is addressed briefly below but the more elaborate discussion it requires will have to wait until Part Three of this series. Part Two takes the theoretical concepts presented below and demonstrates the advantages of applying them to the study of superhero comics. In Part One of this ‘thesis review’ I instead want to present some of the philosophical concepts that informed the approach I took in my thesis to the posthuman body in terms of both theory and methodology. Or to put it another way, the following discussion is about what separates a ‘critical analysis’ or ‘cultural theory’ of superhero comics from, say, reviewing them. Long story short: the questions of how superheroes have developed and what readers get from them are not simple to answer. Or, rather, may lead to a multitude of, often potentially conflicting, answers to those questions depending on the assumptions the questioner starts out with. As such this article lays out my epistemological and ontological framework. As Voltaire once said, “if you wish to converse with me, first define your terms”. Ready to define some terms? Let’s go! I’ve long been fascinated by the idea of cut-ups, I had some familiarity with the concept from reading William S. Burroughs and Genesis P-Orridge but I’d never performed the experiment myself. 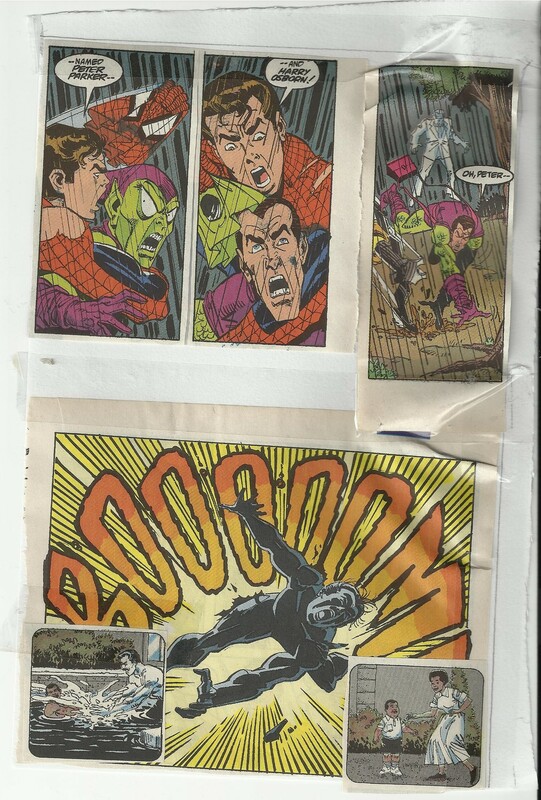 So this post details my experiment in performing the cut-up technique on one particular comic, The Spectacular Spider-Man issue 183, chosen at random because I’d ended up with an extra copy. The full results can be seen here at my Flickr account or scroll down to the bottom of this post . First of all the history and theory of the cut-up will be outlined, followed by a discussion of its more occult implications. 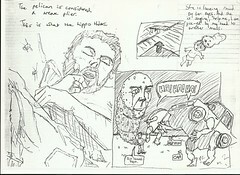 After this outline, I want to relate the technique to Robert B. Ray’s suggestions about using surrealist techniques as a way of theorising film and suggest that the same methods could be applied in the study of comic books. This is not a finely honed theory or methodological prescription however. For now it remains an interesting experiment. That said, the final section will discuss what this particular experiment reveals about Spider-Man. The plan is for this to be the first of several such experiments applying avant-garde artistic methods to superhero comics. Never let it be said that I don’t know how to have a good time! Hello bright and shining stars (albeit encased within sticky, sweaty meat-sacks). Today’s Comics are Magic is a not particularly coherent and potentially unsatisfying round-up of some final thoughts about comic book continuity. For those just tuning in the following post builds on some of the concepts outlined in part 3 and part 4 (if you’re feeling particularly studious the archives are here).